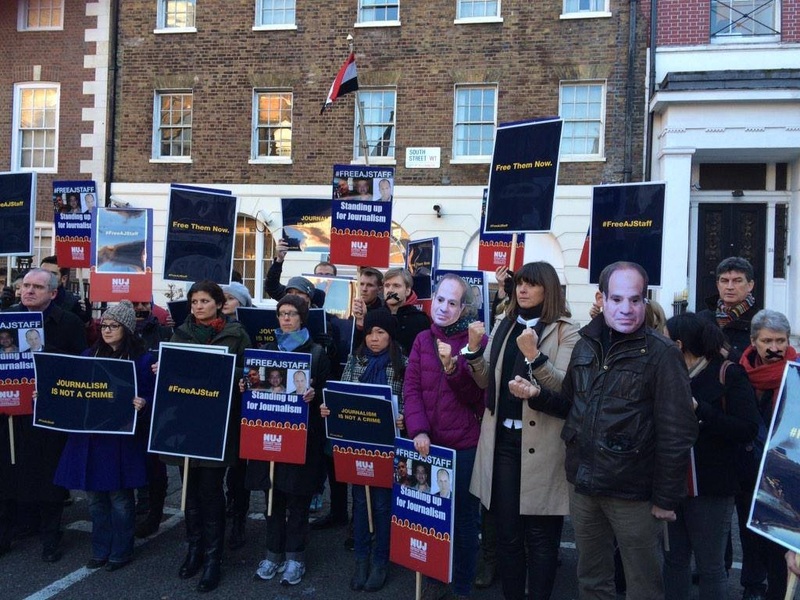 About 30 people showed up to the #FreeAJStaff protest outside the Egyptian embassy in London yesterday on the one year anniversary of the arrest and incarceration in Cairo of Al-Jazeera English journalists Peter Greste, Mohamed Fahmy, and Baher Mohamed. International media figures, National Union of Journalist members, and human rights workers were there calling for their release, as well as all other journalists detained in Egypt. “We want to make sure that the world sees this image of Egypt and sees that they are still holding journalists, and not just our three guys, but other journalists as well,” said Al-Jazeera English journalist Sue Turton. Award winning Australian journalist Greste and Canadian-Egyptian Al-Jazeera English bureau chief Fahmy were arrested at the Marriot hotel in Cairo last year, where they were using a room as an office. Egyptian producer Mohamed was arrested from his home. In June, they received between 7 to 10 year prison sentences. The charges against them include broadcasting false information and aiding a “terrorist organisation” in reference to the Muslim Brotherhood, an Islamist movement that was banned by the Egyptian government just four days before the Al-Jazeera journalists were arrested. The charges, trial and sentences have been widely criticised by human rights monitors and journalists. “The message is to Egypt, and it is to say we will not let the world look away from our three guys who have been incarcerated now for 365 days,” added Turton, who was sentenced in the same case to 10 years in prison in absentia. Sixteen journalists were in prison as of 8 December, according to the annual report of Paris-based Reporters Without Borders, a freedom of information monitoring group. It ranked Egypt as the fourth largest jailer of journalists in the world after China, Eritrea and Iran, and one place before Syria.